Despite its subtitle, Attached is in many ways a book about the “old art” of love rather than the “new science” of adult attachment. It is an easy to read self-help book, but that is not to make light of nor diminish its value. On the contrary, its approachable style and encouraging message should make it very useful for people looking for a relationship and for people who want to improve their relationships. Attached divides people into three broad categories based on their “attachment styles.” “Secure” people comprise roughly one-half the population. They are people who generally enjoy intimacy and are not afraid of it. They communicate their needs effectively and care deeply about meeting the needs of those they love. “Anxious” people crave intimacy but struggle to effectively communicate or advocate for their own needs. They tend to blame themselves for any problems in their relationships. “Avoidant” people are just the opposite: they fear intimacy. They may also struggle to effectively communicate or advocate for their own needs, but unlike anxious people they will blame the other party for any problems in the relationship. One very helpful (if sobering) point the book repeatedly makes is that anxious and avoidant people are often drawn to each other, usually in ways that are mutually unhealthy. The avoidant person tends to give mixed messages about their desires, which anxious people will misinterpret as an invitation to try a little harder–something they are hardwired to do. This is a challenging pattern that is hard for both sides to break. Throughout the book are quizzes designed to help you determine which attachment style describes you. The book is non-judgmental. All three attachment styles are evolutionary responses to environmental stimuli. In regions of great danger, where life is short and violent, an avoidant attachment style is invaluable. If one cannot emotionally move on from a relationship that ends prematurely, the species is threatened. That gift in those troubling circumstances can be a burden in a less traumatic civilization. Other dangers are perhaps less life-threatening, but require a tightly connected family unit in order to successfully navigate them. The anxious style forges that tight unit and promotes looking out for unseen dangers facing our loved ones. That, too, can be a burden in safer environments. Most human societies are more stable and interdependent, where a secure attachment style reinforces that stability. But we all carry the DNA that can express itself in any of the three styles. 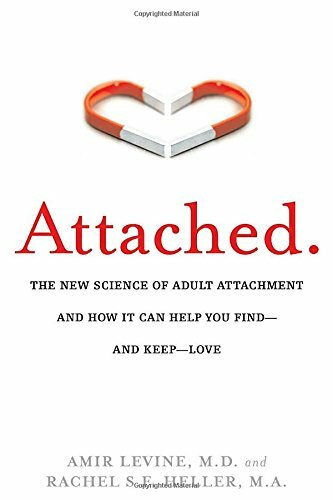 Attached makes the point that successful relationships can occur no matter what your attachment style is. A major contributor to success is effective communication. This can be a challenge for anyone, but the book’s examples and tips are designed to encourage even the most timid to take this essential step. I think that many authors have addressed similar relationship issues over the years. Several have written about the “Five Love Languages,” which at its heart is Attached but with additional subdivisions. Attached, though, does bring some fresh scientific (and non-religious) perspective to the conversation. It may not be quite as personal as “Dear Abby” or “Dear Anne,” but it does give specific tools and goals for improving your current relationship or for improving your chance at long-term love.